The number of Christians abducted by ISIS in northeastern Syria has risen to 220 in the past three days, as militants round up more hostages from a chain of villages along a strategic river, activists said Thursday. In Iraq, ISIS extremists released a video purportedly showing militants using sledgehammers to smash ancient artifacts in Iraq's northern city of Mosul, describing the relics as idols that must be removed. 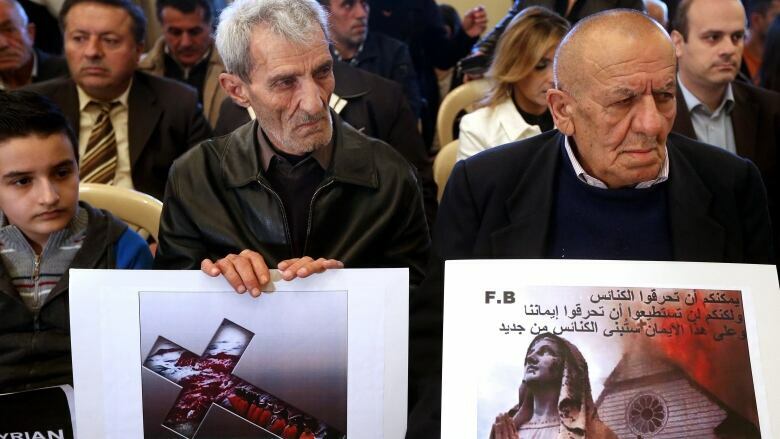 This week's abductions of the Christian Assyrians in northeastern Syria is one of the largest hostage-takings by ISIS since their blitz last year that captured large swaths of both Syria and Iraq last year. The fate of the captives was not known. The province, which borders Turkey and Iraq, has become the latest battleground in the fight against ISIS in Syria. It is predominantly Kurdish but also has populations of Arabs and predominantly Christian Assyrians and Armenians. ISIS began abducting the Assyrians on Monday, when militants attacked a cluster of villages along the Khabur River, sending thousands of people fleeing to safer areas. Younan Talia, a senior official with the Assyrian Democratic Organization, said ISIS had raided 33 Assyrian villages, picking up as many as 300 people along the way. It was not possible to reconcile the numbers, and the fate of the hostages remained unclear. 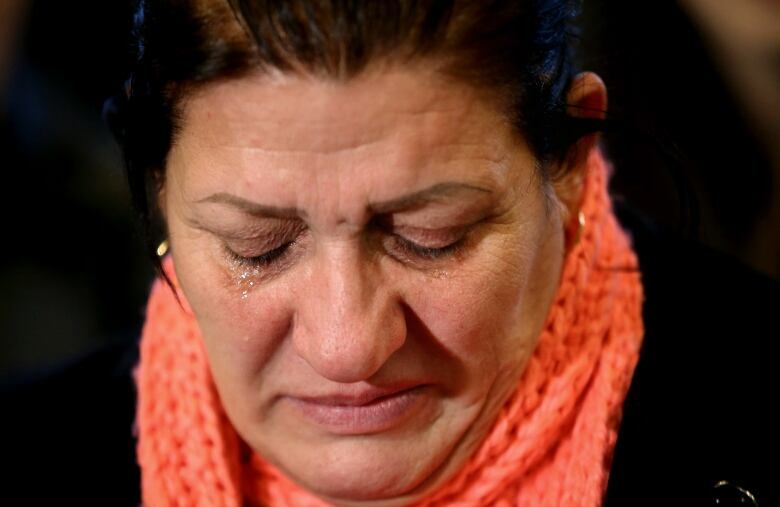 An Iraqi Assyrian woman who fled from Mosul to Lebanon weeps during the sit-in. (Hussein Malla/Associated Press)State-run news agency SANA and an Assyrian activist group, the Assyrian Network for Human Rights in Syria, said the group had been moved to the ISIS-controlled city of Shaddadeh, a predominantly Arab town south of the city of Hassakeh. The Observatory, however, said they were still being held in nearby Mt. Abdulaziz. The mass abduction added to fears among religious minorities in both Syria and Iraq, who have been repeatedly targeted by ISIS. The extremists have declared a self-styled caliphate in the regions of both countries that are under their control, killing members of religious minorities, driving others from their homes, enslaving women and destroying houses of worship. The group has killed captives in the past, including foreign journalists, Syrian soldiers and Kurdish militiamen. Most recently, militants in Libya affiliated with ISIS released a video showing the beheading of 21 Egyptian Christians. The Observatory said negotiations through mediators were taking place between Arab tribes and an Assyrian figure to secure the hostages' release. 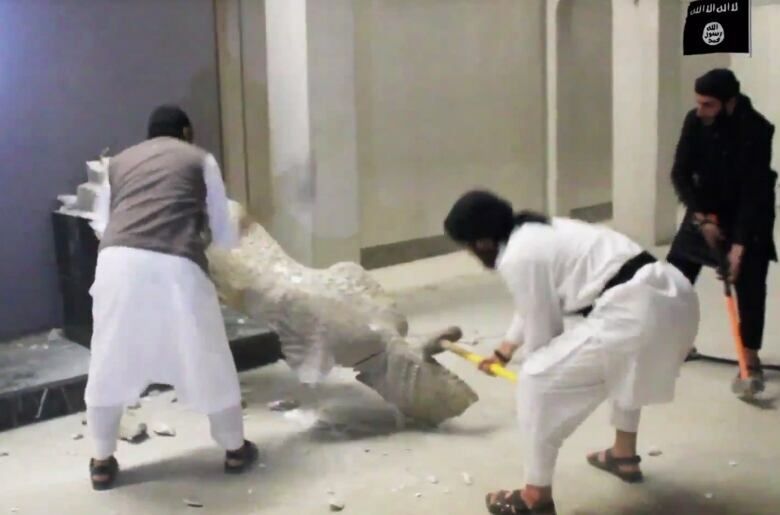 In this image made from video posted on a social media account affiliated with ISIS, militants take sledgehammers to an ancient artifact in the Ninevah Museum in Mosul. (Associated Press)The UN Security Council on Wednesday evening "strongly condemned" the abduction and demanded the immediate release of others abducted by ISIS and similar groups. The White House condemned the attacks, saying the international community is united in its resolve to "end ISIL's depravity." ISIL is one of several alternative acronyms for ISIS. The Assyrians are indigenous Christian people who trace their roots back to some of the ancient Mesopotamians — the ancient Assyrians whose artifacts ISIS is now destroying in Iraq. The five-minute ISIS video released Thursday shows a group of bearded men inside the Mosul Museum using hammers and drills to destroy several large statues, which are then shown in pieces and chipped. The video then shows a black-clad man at a nearby archaeological site inside Mosul drilling through and destroying a winged-bull Assyrian protective deity that dates back to the 7th century B.C. "Our prophet ordered us to remove all these statues as his followers did when they conquered nations," the man in the video adds. The video was posted on social media accounts affiliated with ISIS and though it could not be independently verified it appeared authentic, based on AP's knowledge of the Mosul Museum. Mosul, Iraq's second-largest city and the surrounding Nineveh province fell to the militants last June, after Iraqi security forces melted away.